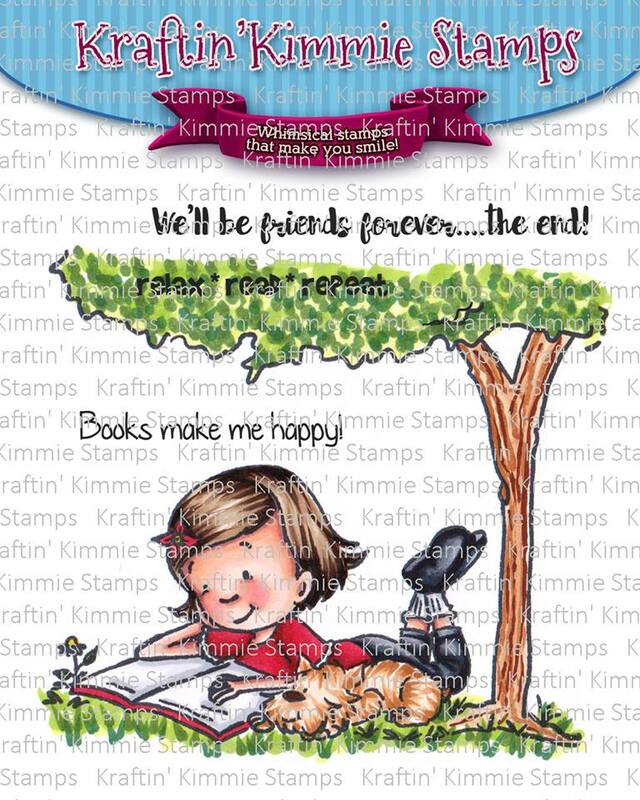 On to Preview Day 3 for Kraftin Kimmie Stamps- what do you think so far? Pretty amazing aren’t they?! I absolutely love every one of them and we aren’t done yet!! Today we are previewing Reading Lexi. Isn’t she just the sweetest?! She is just chillin under the tree, reading her book with her puppy by her side. This adorable image also comes with 3 coordinating sentiments. When I saw this stamp, I immediately pictured her spending the entire day reading which is where my background came in. This whole image is colored with copics – even the sunset background. Check out Lexi and pal in action as you hop around the Krafty blogs today! You’ll see the list of Krafty design team members and Krafty Guests below and be sure to leave some love at each stop because one lucky commenter is going to WIN a gift voucher to the krafty shop! ALL SEVEN of the new July clear stamp sets will be released on Saturday evening! Be sure to join us at the LIVE Online Release Party beginning at 7pm EST! Come join us to help celebrate the new release, check out lots of krafty kreations, have a chance to win some prizes and hang out with all our krafty friends! Hope to see you there! Reading at sunset is so relaxing. Great card Mindy! Fabulous scene. Love the sunset.